Come on board Blue Dolphin Charters' 63-foot catamaran for a leisurely sunset sail along Kauai's spectacular Na Pali Coast. One of Kauai’s best natural attractions is the remote Na Pali Coast. Since this stretch of coastline is inaccessible by car, the only way to see it is either by boat or helicopter. A Kauai dinner cruise is a relaxing way to see this "jewel of Kauai." 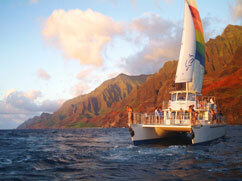 So come aboard one of Kauai’s sailing catamarans and enjoy a leisurely sunset dinner cruise along the Na Pali Coast. This is the perfect way to combine an island sightseeing tour with a delicious dinner. Reserve you Kauai sunset dinner cruise on Kauai-Tours.com and enjoy great savings!